The mention of black widow spiders tends to make people nervous. Their reputation for being very dangerous can cause anxiety and fear because of the unknown. While they should be treated cautiously, knowing the facts about black widows can ease some of that anxiety. The answers to some of our Frequently Asked Questions can teach you the basics of identification, prevention, and treatment. 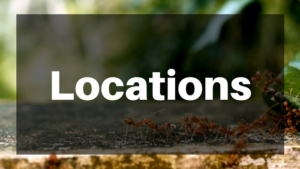 Do Black Widows live in our area? Different species of widow spiders live all over the United States. Here in Texas, we normally see latrodectus mactans, known as the southern black widow. They tend to live in dark secluded areas like under rocks, in crevices, under ledges, and in wood piles. When cold weather our drought drive them into buildings, they are often found in garages, basements, or piles of debris. How do I Identify a black widow? Black widow spiders are most commonly associated with a red hourglass on the abdomen. This is only true of adult female black widows. They are typically shiny black with hairless, globe-shaped abdomens. The characteristic hourglass shape may be reddish or orange and may appear as two separate triangles or even red dots in some species. The males and juveniles tend to be smaller, tan in color, and have white markings. Widow spiders spin webs that are erratic in shape and form. The webs are rough and sticky with very strong silk. Black widows are the most poisonous spider in North America. Their venom is said to be 15 times as toxic as a rattlesnake. That being said, they seldom cause death because they inject such a small amount of poison, and the chances of an encounter while using a pest control service dramatically are decreased. Only the adult females are poisonous, while the males and juveniles are harmless. Overall, human mortality from black widow spiders is less than 1% of those bitten. Those at most risk are the very young, very old, and the family pets. 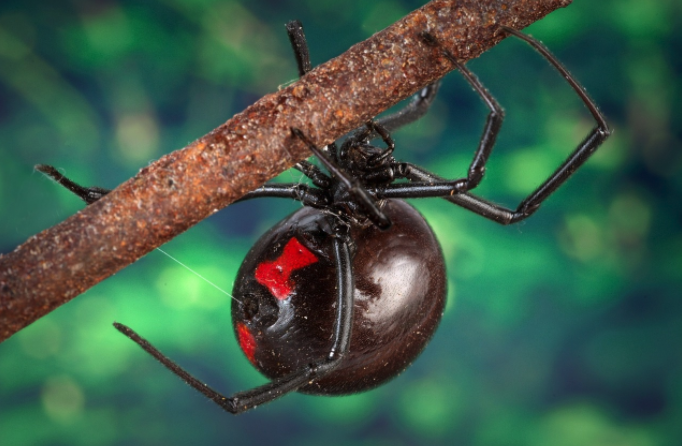 So, while black widows should be treated cautiously and prevented as much as possible, the likelihood of death or severe reactions from a bite is very, very small. What should I do if I get bit by a black widow? The first step is not to panic. Try to catch the spider for proper identification and wash the wound thoroughly with soap and water. Call your physician for advice on further steps to take. Ice is often suggested to reduce pain and swelling at the site. Doctors usually do not administer an anti-venom because it has the risk of anaphylactic side effects, but it is an option. Some of the more severe symptoms can include: abdominal cramping, headaches, pain, profuse sweating, convulsions, and vomiting. In rare cases, hospitalization and monitoring may be necessary. To be safe, always seek a doctor’s advice. How can I prevent black widows? Prevention is the key to good spider control. Here are some ideas that can help. Seal the outside of your home. Use caulk or spray foam to fill in all cracks and crevices that may allow spiders to enter your home. Also check the window screens and weatherstripping around windows and doors to make sure that they are intact. Clear away weeds and other debris that are in your yard, especially those that are close to your home. Change your outdoor lighting. Bugs are attracted to bright white or bluish lights, and where there are a lot of bugs, you will find spiders. Yellow, orange, and pink lights tend to attract less bugs. Vacuum and dust your home regularly to clean up webs, eggs, and spiders. Wear gloves if you are moving boxes or cleaning areas that may house spiders (garages, basements, etc.). Shake out clothing, shoes, and other items that have been sitting for a long time before using them. 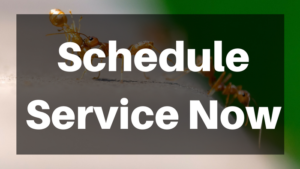 Hire a professional pest control company to treat your home with a chemical barrier that will prevent spiders and other insects. 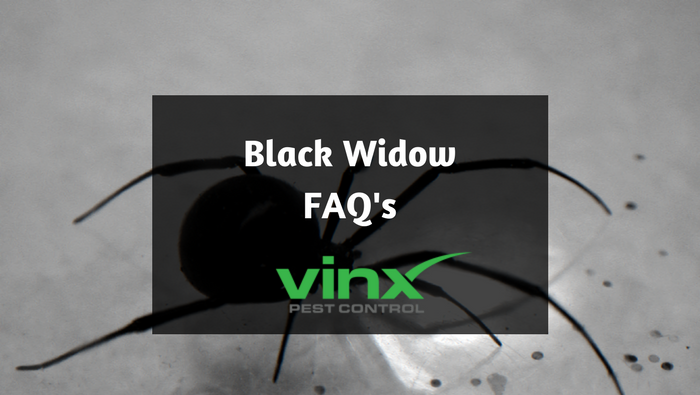 If you are concerned about black widow spiders in the Dallas area, Vinx Pest Control can help! Our team of licensed and trained technicians will come to your home and take care of the problem. We use only the best and safest products and have the best guarantee in the industry. You will feel safe knowing that your home is protected by Vinx. Give us a call today!